A full cleaning of the interior of your home or business is, for most, a weekly habit. It might be obvious when interiors need a tune-up, but exteriors can be a but trickier. Unlike other areas of your property, there is no definitive cleaner for your walls, garage, deck, patio or driveway. Instead of struggling to find what works for you, be sure with our Brampton pressure washing. There is no limit to how many different types of stains that can add up around your residential or commercial property. You might be dealing with man-made problems, environmental issues or just some accidental stains. No matter the stain you are dealing with, assessment is key to your Brampton pressure washing. By examining stains or discolourations, our Gorillas can figure out what we are dealing with and move forward with the best possible treatment method. Once we have devised a plan, treatment is carried out until we have reached the right results for both ourselves and our clients. Instead of pointing, shooting and then calling it a done deal, our Gorillas perform our Brampton pressure washing hand-in-hand with our clients. Our job is not done until you are happy with your results. The exterior of your home is not only concerned with looks. Algae is a real issue with a lot of properties both large and small in the Brampton area. Growth like this can make surfaces like driveways, walkways and sidewalks slippery and bacteria-ridden as well. Our Gorillas use eco-friendly cleaning solutions to protects the area around your living or workspace. 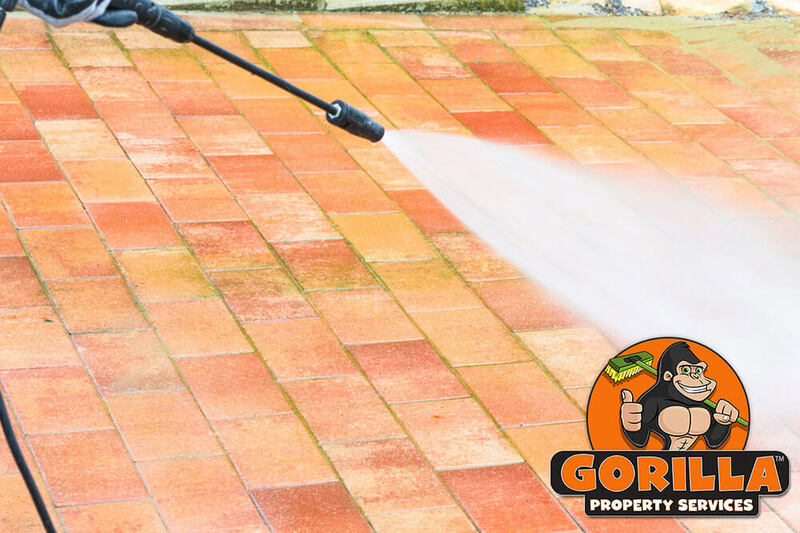 Instead of just going to work, spray the exterior of your property, our Gorillas block off any areas that might be vulnerable to run-off. Keeping your water reservoirs clean from cleaner run off is a vital part of our Brampton pressure washing.